study after study shows long-term severe stress to be damaging to our health causing everything from high blood pressure, obesity, heart attack, depression and infertility. The list goes on. Some stress is good. It revs up the body by producing naturally occurring performance enhancing chemical called adrenaline and cortisol but if severe stress goes untreated for a long period of time performance will ultimately decrease. lets work on relaxing but not so much that we get stuck in a rut. 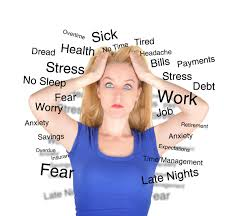 If you have been feeling frazzled lately take a moment and try some of the things on this list. I hope you’ll be more productive and alert after. If you do something that really helps you that you don’t see on this list please comment below and share with the rest of the stressed community. 1. Deep breathing. Take 5 minutes to do nothing but focus on your breathing. make sure your taking deep breaths. breathing through both your nose and mouth. Inhale the fresh air and exhale the bull $#!^. 2. Exercise. No body said it better than Elle in legally blonde. “Exercise gives you endorphins. Endorphins make you happy. Happy people just don’t shoot their husbands, they just don’t. ” The first week or two may be difficult because your body isn’t used to pushing itself. Give it some time to get easier. 3. Make a plan. most often stress is occurring because we don’t know what is going to happen, we feel out of control or we don’t know what to do. Take some time to plan out and learn about what you’re doing. Being prepared is always a great way to feel confident and stress free. 4. Manage your nutrition. Sometimes you may only be stressed out because your body isn’t getting the proper nutrition to function properly causing your mind to feel tired and stressed out. Don’t deprive your body of the nutrients it needs. try to eat whole foods and protein every 2-4 hours and remember if it comes from the sea, a tree / plant, or had a mom then you can eat it. if its MADE in a plant then it’s not for you. 5.Sleep. It’s possible you may not be getting enough sleep or maybe you’re getting too much!. are you sleeping a minimum of 7 hours and a max of 9-10? try to stay between 7-8 hours of sleep. Definitely don’t skip it. 6A. Make a to do list and cross things off the list! Its easy to get stressed out when you have a ton to do but no organization. Create a to do list and do the things you don’t want to do first! By the time your almost done and out of energy you will have gotten the hard things done and hopefully not feel stressed about the little things left over. 6B. When owning a business or being an independent contractor its easy to get stuck in the little tasks of everyday and not do anything to promote our business. Doing that can be stressful because you feel like your working hard all day but you have nothing to show for it. when your making your to do list I want you to put down 2 small things you can do to help better your business and do them! I only want you to put 2 because if you put more than that you will probably feel stressed out. there is always something more to be done. focus on your two items for the day, check them off your list and feel accomplished. if you still have some steam after your two items go right ahead and keep working. but don’t commit to too much in one day. 7. Change your attitude. Sometimes all you need Is a little attitude adjustment. Stop looking at the glass as being half empty and think of it as being half full or better yet look for way how to sell the glass! 8. Write down at least 10 things your grateful for. Really take a moment and feel grateful for what your write down. If you woke up tomorrow with only what you were grateful for today how would your life be? 9. Call up a friend or family member and catch up. Our relationships are what keep us happy. Call a friend or family member and remind them you love them. 10. Ask for a hug, find someone you love and hug the stress out. Just hanging out at my favorite bar. Have you got your workout in today? If you didn’t take a selfie did it even happen? Happy Friday! Joint me at 12:30pm today for a Full Body Workout and Elite Fitness and Performance, Your first class is FREE! Let me know if you are interested! Just in case you can't make it here is a quicky you can do at home or outside so there's no excuses. 15 push ups, 15 squats🏋️, 30 jumping jacks, 20 leg lifts in plank position, 20 reverse lunges, 10 burpees. Rest for 1:00 or as long as you need and repeat this circuit 3-4 times :) let me know if you have any questions! Do you know what your body fat percentage is, right now? Do you know what a healthy body fat percentage is for your gender? Do you know this number is way more important than the number you see on the scale? Your body fat percentage tells you how much of your body weight is made up of fat. In terms of your overall health, your body fat percentage can be one of the most useful numbers available to you, even more so than your scale weight and much more so than your Body Mass Index (BMI). If you have an interest in living a healthy lifestyle, or on a wellness journey your body fat percentage is a crucial number to know that will help you in many different ways. Including making sure you are on the right track. Leave a comment below or dm me if you are interested in setting up a body fat / fitness assessment. I would love to help you create a plan and stick to it to achieve your goals. Final round. I love doing pull ups. Certified Personal Trainer, Fitness Enthusiast , Motivation, Clean Eating, Yoga, DIY, Gym How to`s, Beauty, and Reviews.